DJ EXPO 2014: Imagine being DJ Cassidy right now. Not only does he have one of the most rabid fanbases in the world, but he's also Hollywood's hottest DJ thanks to playing star-studded affairs such as Beyonce and Jay-Z's wedding, and Obama's 50th birthday party. As glamorous and enviable as those gigs are, what DJ Cassidy has lined-up for his forthcoming debut album, Paradise Royale, is even more impressive. Embracing the energy, spirit and sound of dance and soul music in the late 70s and earl 80s, DJ Cassidy assembled a definitive who's who of dance, soul and disco to guest on his album. You have a huge celebrity following. Where did your desire to be a DJ come from? "When I was nine years old, I asked my parents for two turntables and a mixer for my tenth birthday. When I turned ten, I received the greatest gift of my life. I was a hip-hop kid. When I was three years old, I would watch cult classic dance films Breakin' and Breakin' 2: Electric Boogaloo. When I was five years old, I would jump up and down on my bed to Run DMC. When I was 13, I idolized Grandmaster Flash, [DJ] Kool Herc, and Afrika Bambaataa. DJing was my way of contributing to the culture." What hurdles did you overcome during your early years to help you get where you are now? "When I began DJing, my only outlets to perform were at school related functions. I had a burning desire to play all kinds of music, not only from all genres but from all eras. My audiences were narrow and my opportunities to express my true creativity were limited. I learned how to rock my crowds while cleverly exposing them to new music in interesting ways." "Since my teens, every opportunity I've had as a DJ has led to another. I always strived to be the kid people would call on to play all music, for all people, all over the world." Do you remember your first DJ gig? "I think the first time I ever got paid to DJ was when I was 12 years old and an older girl hired me to DJ at her sweet sixteen. I remember feeling a new sense of validation. I couldn't quite believe people would pay me to do what I did for fun. It became real, in a different sense of the word, very fast." What gear did you use a) in the studio during the recording of Paradise Royale and b) when you play live? "I asked all the musicians who played on my album to use the instruments they used on their iconic records of the late 1970s and early 1980s. For example, Nile Rodgers used the same guitar on Calling All Hearts featuring Robin Thicke & Jessie J that he used on his hit records including Chic's Good Times and Sister Sledge's We Are Family. Ndugu Chancler used the same drum set on Make The World Go Round featuring R. Kelly that he used on Michael Jackson's Billie Jean. "When I perform live, I use two Pioneer CDJ 2000s, one Pioneer DJM-900, 1 Rane Serato, custom JH Audio in-ear headphones, and a custom 24-carat gold Shure microphone." You've played big celebrity parties including Obama's 50th birthday, and Jay-Z and Beyonce's wedding. How did you get yourself into the position where you're getting those sorts of gigs? "Since my teens, every opportunity I've had as a DJ has led to another. I always strived to be the kid people would call on to play all music, for all people, all over the world. That goal brought me around the globe and put me in front of a lot of amazing people. "When I noticed someone in the room who I admired creatively, I made it my mission to capture them in some special way. How, I can't quite explain; we would need to ask them." What advice can you give aspiring DJs who want to attain the same level of fame and success? "My first piece of advice is to take advantage of every opportunity you have to actually DJ in front of a crowd. We can only grow when we stand before people. My second piece of advice is to embrace diversity. We can only rock all parties when we know all music." As well as playing celebrity parties, you play mainstream shows too. Is there a difference between a regular audience and a celebrity audience? "There is actually very little difference between a celebrity audience and a non-celebrity audience. Being famous doesn't affect the music people like or the way people party. Everyone likes to dance. Music is truly our universal language." How do you find new material to include in a set? Do you go record shopping, or are you mostly online? "As a young child and teenager, I would go vinyl shopping on weekends. Fat Beats and Rock & Soul in New York City for new records, and House Of Oldies in New York City for older records. As I established myself, the new records began to arrive in the mail. Then, when the internet took over, the new records arrived in a different kind of mail. "One thing remained consistent: I have always kept my ears open. Whenever I hear a song I like that I don't know, I find it. I may hear it on television, in a movie, in a club, or online. It might be easier now to find the song, but the source of interest is the same." "Music is supposed to make us smile. Music is supposed to make us celebrate. Paradise Royale is the sound of celebration"
On Paradise Royale you haven't sampled any existing tracks, instead hiring a 14-piece string section and musicians like Nile Rodgers and Larry Dunn. What motivated you to create music from scratch? "Four years ago, I sought out to bring back what I believe to be the greatest and most universal dance music of all time, the soul music of the late 1970s and early 1980s. No matter where I played in the world, no matter who was in front of me, no matter what kind of music people expected to hear, I found that the classic hit records of this era touched everyone - people of all ages, races, shapes and sizes. These songs made everyone move, everyone dance, everyone smile. "First, I put my favourite 25 songs from this era into a playlist in iTunes and put them in chronological order. All the songs fell between the years of 1978 and 1982. Then, I made a list of every musician who played on each of the 25 songs. When I finished, I found that many of the names kept reappearing. I concluded that they were the true architects of this sound. These were the men behind the music. "To capture this intoxicating energy, spirit, and emotion, I knew I needed to go to the source. I united 22 of the most legendary musicians of this era for the first time in over 30 years to channel their definitive sound with no samples, no covers, no interpolations, no machines. "The list of musicians includes Verdine White, Philip Bailey, and Larry Dunn of Earth Wind & Fire, Robert 'Kool' Bell of Kool & The Gang, Nile Rodgers, Ray Parker Jr, Patrice Rushen, Wah Wah Watson, Marcus Miller, John 'JR' Robinson of Rufus, and many more." What was your role on Paradise Royale, considering the wealth of talent you worked with? Were you composer, DJ, project manager, visionary? "After conceiving the vision over four years ago, I produced all ten songs on Paradise Royale with my production partner Greg Cohen." "I have ten favourites. Each song was a journey. Each song is an opus. Each song is near and dear to my heart." Finally, with Paradise Royale's release right around the corner, are you confident it will be well met by your fans? "I am, indeed. Music is supposed to make us feel good. Music is supposed to make us smile. Music is supposed to make us celebrate. Paradise Royale is the sound of celebration." 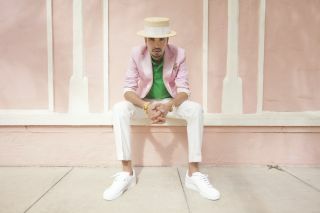 DJ Cassidy's debut album Paradise Royale will be released this summer (2014).